There's No Place Like Home: Santa and A Surprise Party! 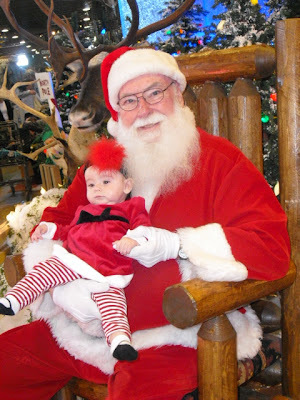 We went to see Santa today! We always go see him at Bass Pro Shops, because the pictures are FREE! And they let you take your own pictures too! They also had a free carousel that Katie loved! Free fits our budget right now! Ummm, Mommy had to get in the Santa picture this year, because Katie wanted nothing to do with him! I don't think he wanted anything to do with her either! I sneakily got this picture of Katie and Santa in the same frame! Then it was nap time in the tent! My mom said when I was little I crawled in one of those beds in a department store and got under the covers! Sadly, she was the most brave at 5 months old! It was still lots of fun, and we will try again next year! Monday night was super fun too! I had a surprise party for my friend Laura! I call her Laurie, because her husband's name is Bobby. And it's hard not to say Bobba and Laurie instead of Laura and Bobby. So their names are Bobba and Laurie and have been for the past 10 years! Laura turns 40 next month, so I had a STILL 39 party for her! We had such a fun time! It's rare that we can all get together with out kids. OK here's Anna trying to learn the Gangnam Style dance from the video. Rene is a good friend to hold the phone for her! It was fun celebrating Laura! She is such a sweet, funny, and thoughtful friend! We had lots of leftovers from the party, so today my mother-in-law and my niece and nephew came over for lunch! Katie is nekkid, because she is eating a chocolate cupcake. And a bib is no match for a 2 year old with a chocolate cupcake! Tomorrow is Katie's last day of school for the year, so I need to start and finish my Christmas shopping! Oh that looks like fun! I know the feeling. I turn 40 in May. All my friends had their kiddos young so most of us don't really get together. I'm in a totally different stage than they are. This makes me really miss having a group of friends to hang out with. On a more up beat note... Thanks for the tip about Bass Pro Shop! We always end up at the mall with $25 crappy pictures and strict "no photos of your own" rules. Looks like y'all had a blast. Laura is such a sweetheart and what a great friend you are to celebrate her. Love Anna's dancing . It wouldn't be a party without a performance from Anna. Gotta love her.